Mortgage interest rates are on their way up as Freddie Mac’s Primary Mortgage Market Survey® shows an increase in average fixed mortgage rates for the third consecutive week. Even with the increase, fixed mortgage rates are still near their late May, 2013 lows. The 30-year fixed-rate product is averaging 3.80 percent for the week ending on February 26, 2015, up from 3.76 percent reported in the previous week. The 15-year fixed is up .02 percent from the previous week to 3.07 percent. In addition, the 5-year Treasury-indexed hybrid adjustable-rate mortgage increased .02 percent to 2.99, down from last year’s 3.05 percent. The 1-year Treasury-indexed ARM decreased .01 percent to 2.44 percent, down from last year’s 2.52 percent. 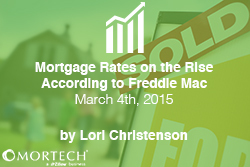 Strong housing data is credited with the increase. According to an estimate released by the U.S. Census Bureau and the Department of Housing and Urban Development, new residential sales in January 2015 increased 5.3 percent from the previous year to 481,000 units. As a result of mortgage interest rate increases over the last three weeks, Mortgage Bankers Association is reporting a 3.5 percent decrease in mortgage applications for the week ending February 20, 2015.